The Best Eco Friendly blogs from thousands of top Eco Friendly blogs in our index using search and social metrics. Data will be refreshed once a week.Also check out Top Eco Friendly Youtube Channels list for Top videos on Eco Friendly. 2.22 Saved By Grace - Green living, DIY, Recipes, Health and more! 2.31 Green Your Decor - Your guide to stylish, sustainable decorating! 2.57 Growing a Green Family - Eco-friendly living year around..
2.71 Environmental Health-Wellness-Beauty...Get Informed Now! Eco Friendly newsletter is a comprehensive summary of the day's most important blog posts and news articles from the best Eco Friendly websites on the web, and delivered to your email inbox each morning. To subscribe, simply provide us with your email address. Facebook fans 111,986. Twitter followers 75,120. About Blog The idea behind Ecofriend is simple: to inform and educate consumers who love to possess the latest gadgets and products available in the market and who are also concerned about the environment around them. Facebook fans 69,879. Twitter followers 10,224. San Francisco, CA About Blog A place for products, methods, and solutions that Redditors can use to become more eco-friendly and green. Facebook fans 1,128,032. Twitter followers 494,965. Brisbane, Australia About Blog Australia's favourite eco friendly store since 2003. Facebook fans 176,073. Twitter followers 2,929. Canada About Blog Discuss environmentally friendly products, deals, tips, and more. Facebook fans 61,005. Twitter followers 68,370. Virginia About Blog Dedicated to inspiring your home and garden with beautifully-crafted, eco-friendly décor from around the world, VivaTerra strives to bring you products that represent our commitment to sustainable materials and practices. Facebook fans 4,291. Twitter followers 1,214. Singapore About Blog Little Green Dot is an eco-lifestyle guide for busy people who want a healthy, happy & green life, with ideas for your home, family, beauty and lifestyle. Facebook fans 10,919. Twitter followers 2,018. India About Blog Ecoideaz aspires to be an exclusive website that acts as a repository for innovative green ideas both from the investor and consumer perspective. Facebook fans 4,965. Twitter followers 384. Westchester, NY About Blog Karen lives a simple, frugal, and green life. She sells functional handmade eco-goodies on Etsy and blogs about green DIY, product reviews, sponsors giveaways, eco tips and news. Facebook fans 7,779. Twitter followers 4,061. Orlando, Florida About Blog Get Green Be Well is a fun resource of how going green can also help you live a healthier life! With product recommendations, honest reviews, eco-wellness tips and tricks, giveaways, travel ideas and hints of where to go shopping. Facebook fans 1,149. Twitter followers 2,949. Republic of Mauritius About Blog EcoFriendlyLink is your one-stop resource for everything green and eco friendly. Facebook fans 80. Twitter followers 4,908. New York About Blog Eco-friendly, non-toxic, natural & organic product info for moms, expecting moms, their babies & families. Facebook fans 1,416. Twitter followers 1,318. 22. Saved By Grace - Green living, DIY, Recipes, Health and more! Washington, D.C. About Blog Big Green Purse Urges Women to Use Their Consumer Clout to Protect the Environment – and Themselves Diane MacEachern’s message is simple but revolutionary. Facebook fans 1,809. Twitter followers 5,829. Facebook fans 1,482. Twitter followers 68,461. About Blog The green technology industry is responding to the need to preserve the planet for generations to come – bringing its ideas to the mainstream almost overnight – and U.S. Green Technology is seeking out the latest in the movement to share with you. Facebook fans 2,239. Twitter followers 3,050. Facebook fans 24,062. Twitter followers 6,732. 31. Green Your Decor - Your guide to stylish, sustainable decorating! About Blog Being green and energy efficient and how to be eco-friendly. Facebook fans 10,615. Twitter followers 1,463. Alberta About Blog Welcome to Of Houses and Trees, a blog about sustainable design, sustainable living, sustainable eating - sustainable everything! Facebook fans 174. Twitter followers 57. About Blog Plastic-Free Tuesday: One day a week no plastic purchases or waste! Follow us for tips about using less plastic. One day at a time, small steps! Facebook fans 1,831. Twitter followers 4,477. Facebook fans 819. Twitter followers 4,802. About Blog Greenne.com is an eco friendly blog covering the most important and talked about green issues of our time. Los Angeles, CA About Blog Eco-friendly tips, news and entertainment for a greener life. Facebook fans 2,229. Twitter followers 242. Leeds, England About Blog Follow us to keep up with the latest recycling and waste management tips and info as well as company and industry news and information. Facebook fans 586. Twitter followers 3,023. Burlington, ON., Canada About Blog Welcome to our eco-friendly blog. We offer reusable insulated stainless steel water bottles for hot and cold liquids, environmentally friendly. Read our latest news and information on how to live and promote a green lifestyle. Browse our recent posts. Facebook fans n/a. Twitter followers 5,484. Chicago, IL About Blog Just another story of boy meets girl at college except this girl was born in the Caribbean and this boy was born in Scandinavia! They met in New Mexico of all places and are now married with 3 children. They live in the suburbs of Chicago, 3 continents and 2 languages in one house. It is fun and loud and green living at its finest. Facebook fans 13,163. Twitter followers 24,660. About Blog Dedicated to all things minimalist, green/eco friendly, zero waste and vegan. I'd love to get to know like-minded people so please subscribe and comment. If you have a similar channel you think I'd be interested in please let me know so I can subscribe to you too. About Blog Wild Beasts Art is an online platform for ethical consumer awareness and artistic expression. We believe you deserve beautiful unique products but not at the price of our planet or people's welfare. Wild Beasts Art’s mission is to create a community that thinks critically about how we can all encourage healthy living and a healthier planet. Facebook fans 80. Twitter followers 38. Mumbai, India About Blog Greenhandle is an Online B2B marketplace to provide eco-friendly customized products such as paper bags, Handmade Paper Bags, Non-Woven Bags, Jute Bags, newspaper bags ,Pouches, boxes, Office Product, Food Product & Safety Product and made from recycled materials in India. Facebook fans 177. Twitter followers 125. About Blog Feel beautiful. Live beautifully. All of our products are made from earth-friendly ingredients to help you look good and feel good about it. Facebook fans 356,553. Twitter followers 18,546. Lake Tahoe, Nevada About Blog BantheBottle.net is a blog devoted to banning plastic water bottles while staying hydrated. Facebook fans 3,876. Twitter followers 1,118. USA & Canada About Blog Let's raise our kids in a greener world! Learn about moms who are living green & teaching their kids to do the same. Get eco-lifestyle tips for your family! Facebook fans 6,199. Twitter followers 2,128. USA About Blog My blog is all about Green living, organic gardening etc and also the green products that can be used to make this world a better place to live in. You might be surprised and think you only want to learn one thing but will come away from the blog learning lot of other green tools. Facebook fans 6,444. Twitter followers 6,350. Cincinnati, Ohio About Blog Hi, I’m Amanda! Here on The Eco-Friendly Family I discuss my life alongside topics that are important to me and my family, like getting fit, composting, cloth diapers, safe products, and tips on reducing chemical exposure to name a few. I like to approach green living from a practical, modern perspective. Facebook fans 16,588. Twitter followers 8,576. US/Canada/Worldwide About Blog Ecodiva beauty provides luxury, non toxic and organic beauty products, skin care products, makeup products, hair products, bath and body products and organic recipes for skin & beauty care. Facebook fans 7,176. Twitter followers 6,716. 57. Growing a Green Family - Eco-friendly living year around..
Portland, Oregon About Blog Growing a Green Family is a weblog focused on helping families to live green (or live greener) with all the other ups and downs of family life. My own family home unit is me, (Jennifer) and my son Cedar. Facebook fans 1,439. Twitter followers 1,533. Facebook fans 12,102. Twitter followers 4,752. Boston, MA About Blog Step by step to a greener lifestyle. Easy greening for families! We are a husband and wife team who want to help others get started living greener and saving money by doing simple and affordable things that make a big difference in your community and the world. Facebook fans 4,150. Twitter followers 4,559. Vancouver/Chicago/Guatemala About Blog The Green Mama grows greener families and businesses through research-based support for those trying to create healthier, sustainable lives. The Green Mama was founded in 2007 by Manda Aufochs Gillespie. Facebook fans 3,793. Twitter followers 2,459. Arizona About Blog ENSO Plastics was created with a vision of making the world a cleaner place through plastic solutions that are better for the environment. Our goal is to end plastic pollution by developing earth friendly plastic solutions. Facebook fans 449. Twitter followers 1,444. Aylesbury, UK About Blog Eco Tech Daily was founded in April 2014 by British writer Craig J Todd. He is passionate about technology and its potential to have a positive impact on our environment and lives. Facebook fans 85. Twitter followers 12,357. About Blog Eco-friendly and adorably chic, Wrappily is a smart new take on wrapping paper—great patterns printed on 100% recyclable and compostable newsprint. Our reversible gift wrap makes a gift look great, and not at the expense of the environment. Facebook fans 1,196. Twitter followers 504. Dallas, TX About Blog EcoView Homes offers modern eco-friendly homes with quality construction to home owners in a downtown urban area. Luxury condos for sale in Dallas, TX. Facebook fans 334. Twitter followers 38. Facebook fans 25. Twitter followers 340. Facebook fans n/a. Twitter followers 7,821. About Blog With over 35 years of living green, research work and supporting a sustainable environment, we are proud to offer selections of the finest “green” tips, products & reviews around. Facebook fans 614. Twitter followers 6,951. 71. Environmental Health-Wellness-Beauty...Get Informed Now! USA About Blog Our future depends on our knowledge and actions. What choices will you make today? Facebook fans 1,846. Twitter followers 17,374. New Jersey, USA About Blog The mission of the site is to inform the general public about green living and promote healthy alternatives to the mainstream by sampling products and publishing reviews. Facebook fans 745. Twitter followers 8,018. Brighton, UK About Blog Claire potter design is an award winning eco design practice. We actively research and speak about the role of design in the circular economy, marine litter and plastic and push ourselves to forefront of sustainable design. Facebook fans 176. Twitter followers 4,117. United Kingdom About Blog Hi, I'm Kate Arnell! Nice to meet you. I've been living a zero waste lifestyle in London for nearly 4 years and this is my YouTube channel where I get to release my inner eco-enthusiast.I'm super passionate about zero waste, choosing organic, eco fashion, seasonal food, exploring and eco friendly alternatives. Facebook fans 1,108. Twitter followers 4,995. 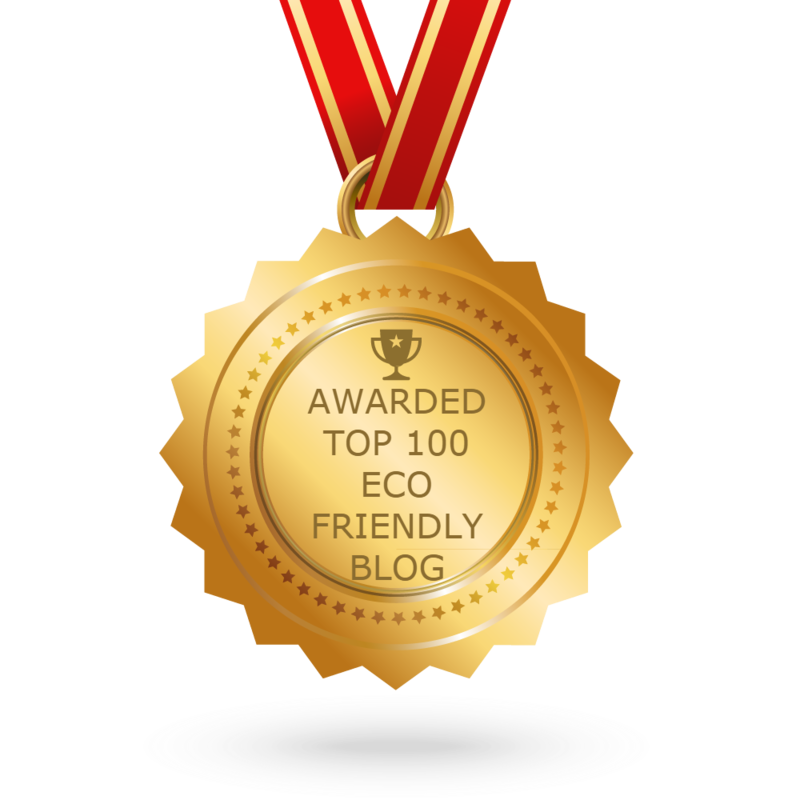 CONGRATULATIONS to every blogger that has made this Top Eco Friendly Blogs list! This is the most comprehensive list of best Eco Friendly blogs on the internet and I’m honoured to have you as part of this! I personally give you a high-five and want to thank you for your contribution to this world.